A powerful account of the current wave of mass extinctions ushered the Class of 2018 into the intellectual life of the campus. Last summer’s reading for incoming students, The Sixth Extinction: An Unnatural History, extended into a year-long conversation, and included a visit from author Elizabeth Kolbert, faculty talks, an art exhibition, and other cultural events organized around the topic of extinction. This is the first year the college has taken this approach. “It gives the book a longer shelf life and takes it to a new level,” says Dean of Students Paul J. McLoughlin II, noting a multi-media exhibition at the Williams Art Gallery marking the centennial of the extinction of the passenger pigeon served as the catalyst for choosing Kolbert’s book. 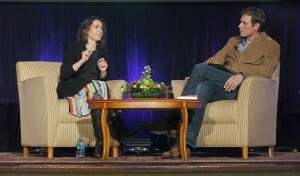 Author Elizabeth Kolbert speaks with geology professor David Sunderlin during her visit to campus. In past years, discussion about the assigned book was relegated to 90 minutes during new student orientation, says McLoughlin, which isn’t a lot of time to “unpack” the theme of the reading. During orientation this year, faculty members from each of the academic divisions gave a TED-style talk that dissected the book through different disciplinary lenses. This approach not only illustrated the value of a liberal arts education, it set the stage for later discussion in First-Year Seminar courses, says Erica D’Agostino, dean of advising and co-curricular advising. “I wanted the students to see not just the timespan in the book, that Kolbert was telling a geological history of the world, but to help them see that they were part of this timespan, that the geology and climatic changes under discussion were living and changing over eons and also right now under our feet,” says Cohen. Kolbert, who is also a staff writer for The New Yorker, delivered the College’s annual Thomas Roy and Lura Forrest Jones Visiting Lecture in Colton Chapel in February. She discussed the methodology of her research as a journalist, saying she’s a conduit between the scientific community and readers. That resonated with Kevin Jackson ’15, an orientation leader for Cohen’s FYS. 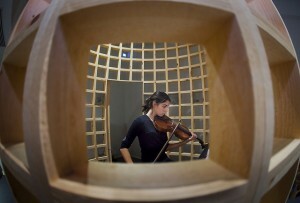 Joanna Harris ’17 plays viola while in a giant bird cage. The theater department performed the play ‘Song of Extinction’ as readers’ theater in the Williams Center Gallery. Michael Pestel’s exhibition, ‘Requiem, Ectopistes Migratorius,’ which explored the extinction of the passenger pigeon, served as both the setting for the actors and an environment for the audience. “The book had a lot of gravity to it,” he says. A chapter on efforts to save the Panamanian Golden frog motivated him to participate in Lafayette’s Alternate Spring Break trip in January to study sea turtle conservation in Costa Rica. Alexa Gatti ’16, president of Lafayette Environmental Awareness and Protection, also drew inspiration from Kolbert’s visit. Lafayette has been assigning incoming students a book to read over the summer since 1992, says D’Agostino, noting the practice serves as a nice transition from high school to college and creates community through shared discussion. Interesting discussion but to be completely accurate there is nothing unnatural about the sixth extinction. Human beings are no less natural than bears and honey bees and so our actions on the environment around us are just another natural event as well. This is more than semantics. Calling something natural or unnatural creates a false dichotomy that one is automatically good and the other is obviously bad.